Everyone in our unconventional family of love and care, both children and staff alike, have been looking forward to celebrating Izabela’s birthday. 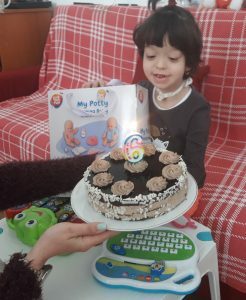 During the last couple of weeks, the centre’s family physician and medical staff have been constantly monitoring Izabela to avoid her getting chickenpox, and the party was postponed until everyone was sure she was ok. With a five day delay, on the 30th of March we managed to organise the event, order the cake and prepare the presents for our special young lady who continued to be in good health. Izabela is a special and dear child, a favourite among us all. Each day means a new step made towards progress and leading an independent life. We felt incredibly blessed to be able to see Izabela experience the anticipation of a present and cake. When the cake made its grand entrance, everyone clapped and sang a belated happy birthday. She couldn’t decide what to do first, eat cake or unwrap the present that was handed to her. After many kisses and hugs, Izabela got to see this year’s special present, an adorable baby toy that needs soothing, to be held, to be fed and another feat is that it wees using a potty. The set includes a toy baby, a binky, a potty and nappies. Izabela is a natural when it comes to infants as she is usually by the side of our care staff and likes seeing what takes place in the residents’ ward and how the babies are fed and changed. We had fun showing Izabela how to put on the nappy on the toy baby. Both Claudia and Izabela had fun playing with the new toy. The idea to give her a toy baby came from the fact that she loves to wear surgical gloves, protection gear and helps the care staff when the babies are changed and fed during the day. Izabela received other beautiful and handy presents like modern and colourful clothes, age appropriated, but nothing surpassed her joy of receiving her new favourite toy. Happy birthday, Izabela, and many happy returns! You make us proud every day!